This cauliflower mac and cheese would convert even the most ardent of mac and cheese purists. 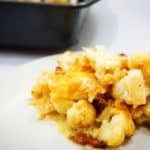 There are a couple of decisions that we’ve made to ensure that we come out with a delicious crispy cauliflower mac and cheese recipe that’s a step above any you’ve tried before. Often times cauliflower mac and cheese recipes will call for boiling, steaming or baking the cauliflower. Instead, we pan roast the cauliflower to perfection with bacon. The cauliflower will absorb all of the flavor of the bacon and it will also have a much better texture than other preparation methods. We achieve a perfect al dente cook on the cauliflower, as well as a nice golden brown color. This can’t be replicated with any other cooking method! My favorite type of mac and cheese has a crispy top on it. There’s something to be said for the traditional shells with cheese sauce style, but it pales in comparison to a well cooked mac and cheese with an extra crunchy and cheesy topping. To achieve that crisp you’re normally going to turn to bread crumbs…but carbs! In place of bread crumbs we’re using pork rinds. Pork rinds crisp up just as nicely and give a nice flavor to the final dish. One word of caution in the preparation of this dish is that both the bacon and pork rinds have a good amount of salt in them, so you may want to take it easy on the amount of salt used. Simply add a healthy dose of crushed pork rinds to the top of your cauliflower with cheese sauce and bake! The last step is to bake and broil this cauliflower mac and cheese. The broiling time we recommend is 3-5 minutes, but this can vary a lot from oven to oven. I’d recommend keeping an eye on it the entire time it is broiling to make sure it doesn’t burn. This will also allow you to pull it out when you have achieved the exact amount of crisp you want. Our pictures show a broiling time of four minutes as a reference point. If you’re looking for more low carb cauliflower recipes, check out two of the most popular recipes on our site. Cauliflower hash browns and our asian style cauliflower fried rice! Recipe Video is included in the body of the blog post! Dice the bacon and separate the cauliflower into "macaroni" sized pieces. We do this by hand, but you can also use a knife. Add bacon and cauliflower to the skillet and allow to cook for 5 minutes, or until the bacon is nearly fully cooked. Dice the onion, finely chop the garlic and add items to the skillet. Cook for 10 more minutes or until the cauliflower is cooked and the onions are translucent. You'll want to cauliflower to be slightly al dente so that it cooks the remainder of the way in the oven. Combine butter, cheddar cheese(1 cup), and heavy cream in a small saucepan. Cook on low heat until everything is melted and combined. Season with salt and pepper. Place the cauliflower mixture into a baking dish. We use an 8x8. Top with crushed pork rinds and the remaining cheddar cheese.